Car detailing is one of the best investments you can make for your INFINITI vehicle. Not only will car detailing help you show off your brand new car, but you’ll also be able to keep your car looking new for as long as you own it. Having a clean car means your car will look nice inside and out. It also means you can finally get rid of that funky smell from dirt left by soccer cleats and football uniforms.Washing your car yourself, or taking it through one of those quick drive-through car washes can cause unknown damage to the finish of your vehicle. Though it’s super fun to do with the kids, when you wash your car yourself, the wind and sun can make cleaning your vehicle much harder. The sun can dry the detergent onto your car which leaves residue which slowly eats away at your shiny finish. Wind can blow dirt onto your sudsy car and get rubbed in as you wash it, grating on your paint. When you wax, the same dirt gets rubbed into the finish, and if you’re not getting all of that wax off when you buff, you will likely end up with swirls or streaks. When you take your vehicle to a drive-through car wash, the harsh cleaners they use to get the dirt and grime off (especially in the no-touch ones) will damage the shiny finish off your car in no time, leaving it still dirty and damaged. Getting a professional car detailing, however, keeps your car looking new. With our professional cleaning products that stand up to the standards you expect for your INFINITI, you can be confident that your car will be well taken care of. And with our strong attention to detail, you’ll leave with your car looking shiny and new. Cleaning the inside of your car yourself sometimes means missing the dirt, dust, and crumbs in the small cracks. At Salerno Duane INFINITI of Denville, our detailing staff is trained to look for the small details, pay close attention to everything from smell to look so that you leave feeling confident in your investment. 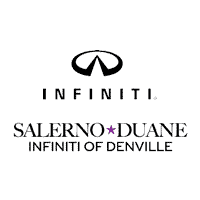 Come in to Salerno Duane INFINITI of Denville, and you’ll not only get that professional job, but you’ll also get all of the benefits of the friendly and efficient staff and facilities you can only get from our dealership. Located conveniently in Denville, we’re just minutes away from Rockaway Township and Parsippany. We are located at 3103 Route 10. We also offer a full suite of services at Salerno Duane INFINITI of Denville including regularly scheduled maintenance like oil changes and brake repair services. We’re happy to help whether you’re just looking to get your car detailed, or you’re ready to begin a relationship of trust with your local INFINITI dealership. Whether you’re looking to clean up those crumbs and leftover dirt, we want to help you protect your investment and keep your car looking as fine as it did the day you bought it.